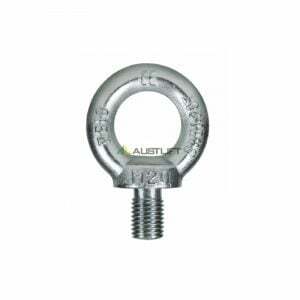 The eye bolt, like the eye nut, is a key feature in any industry that involves lifting heavy material. You will find an eye bolt in almost every single industry where heavy items have to be secured or moved. Because they are the backbone of a lot of heavy lifting equipment, choosing the wrong one can have dire consequences for your equipment and staff. At All About Lifting & Safety, our professionals will provide you with a personal consultation to help you pick the right eye bolt for your heavy lifting needs, saving you time browsing the hundreds of types out on the market. 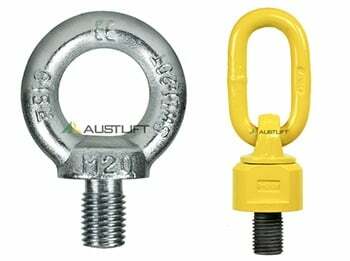 At All About Lifting & Safety, we stock a wide range of eye bolts to cater to every heavy-lifting need. It can be hard to narrow down your choices because of the sheer number of lifting eye bolt variations on the market, which is why our professionals are on hand to help. Screw eye bolt. These are the most commons bolts in industry and can be used for most light duty lifting on-site. Regular nut eye bolt. Only suitable for lifting in straight lines as any variation from this can break or bend the bolt. This could result in staff injuries or damage to your equipment. Machinery eye bolt. This is the one type of lifting eye bolt that doesn’t require an eye nut when in operation. Should nut eye bolt. This type of lifting eye bolt can do what the regular type can’t and lift heavy loads at angles, and not just in straight or horizontal directions. At All About Lifting & Safety, we are Australia’s leading supplier and advisor of all heavy lifting materials and protocols. Contact us today to find the right eye bolt for your needs. At All About Lifting & Safety, we are Australia’s leading supplier and advisor of all heavy lifting materials and protocols. Contact us today to find the right eye bolt for your needs.